For a Friday that was billed as a "Party at the Spa," things got off to a traumatic start. A horse was euthanized after breaking down in the first race. A horse had a heart attack and died in the second. Jockey Kent Desormeaux broke a bone in his neck. 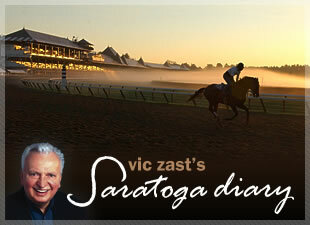 Only six New York-bred fillies partook in the $70,000 Saratoga Dew. The stake was supposed to be run earlier this week, but there were not enough takers. Wicked Diva, owned and trained by Michael Hushion, took her time like a diva in winning, but won nonetheless. Jockey Ramon Dominguez aboard Overseas Market lodged a foul against Javier Castellano aboard Palooza and their final places in the fifth were reversed. Being placed second really hurt Castellano. He fell two back of J.R.Velazquez in the rider standings when Velazquez squeezed Cookram Rock between runners at the last possible instant to triumph in the fourth. Palooza was a first time starter that dropped from the morning line odds of 12-1 to 9-2 at post time. The winner of the sixth race, Winter Memories, was listed in the program as a roan. But her coat was more of the peachy/pink/salmon shade that graying men dye their hair. Two of Winter Memories’ 10 opponents had the lead and surrendered it. But when rider Jose Lezcano told the daughter of El Prado that it was her turn, she didn’t. With three minutes before the gates opened for the Gr.3 $100,000 With Anticipation, the favorite Powhatan County was 2-1 and the nine other runners were 5-1 or better. If you were to bet Soldat at 8-1 to win, you would have been looking for value in potential. The two-year-old son of War Front had not run on the turf before, yet had finished second twice previously, once to Wine Police, the likely Hopeful favorite. The promise of music and drink at The Post helped attendance a bit. Still, only 14,719 diehards passed through the turnstiles. On Saturday and Sunday evenings the city takes a turn at trying to bring folks out with the Final Stretch Festival. Don’t go to One Caroline Street Bistro for small talk if one man in your party is hard of hearing and the other has a paralyzed vocal chord. Otherwise, Dave and Diane Pedanotti prepare scrumptious New Orleans cuisine. Aaron Pedanotti, their son and a waitperson, said the family gave up its Mouzon House concession on the track’s Restaurant Row because juggling three businesses became strenuous. It’s too bad because last year their muffaletta was the racecourse’s best sandwich. On the topic of food, one Saratoga Diary reader wants other readers to know that Ice Cream Man ice cream can be bought at The Meat House in nearby Wilton. But isn’t that like watching the Saratoga horse races at the Albany teletheater?